Here’s a little reminder of how the kitchen looked when we moved in. Note in the first picture there is an upper cabinet beside the window. To the left of it, above the fridge is another, shorter cabinet, slightly useless since it’s so far back. You know the type, you may even own one yourself. Move forward to the next phase where we had Renuit Cabinet Refacing come in and give us a brand new kitchen by changing the doors and drawer fronts, adding height to the upper cabinets so there’s no more of that greasy dust problem, and adding pots and pan drawers to the lower cabs to the right of the stove and across, to the right of the fridge. Mind blowing to think that the layout and the boxes changed not at all, yet there’s not one inch of resemblance to what once was. Thankfully! Sorry Oak lovers, I’m breaking up wit chu. 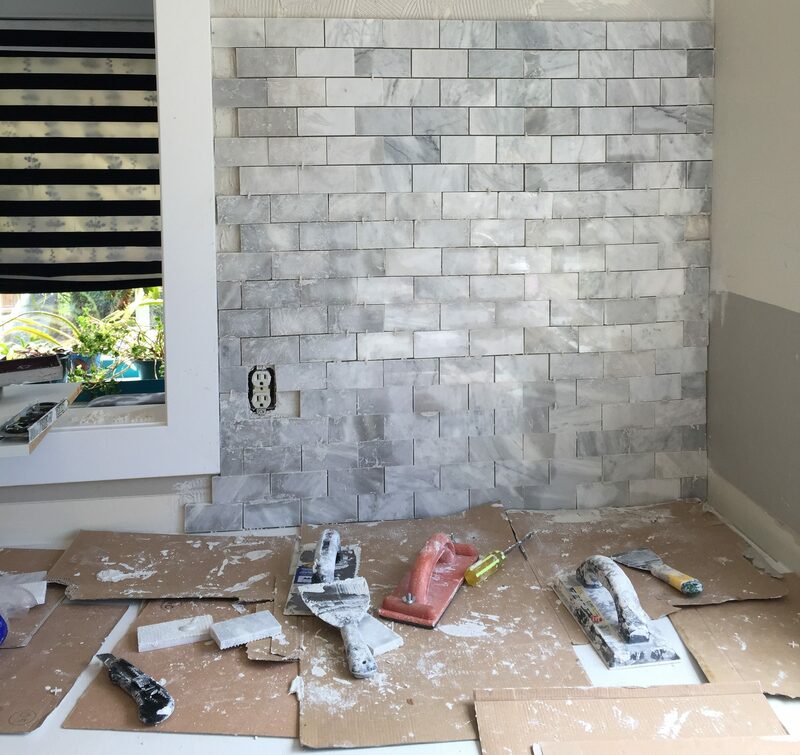 Next comes the decision on what to use as backsplash, because the plan is not just to put it on the 16 or so inches under the cabinets, but on all the wall space that is visible. And also – who will do it? Moi?? Maybe…depends on how much I am willing to risk my marriage, I think. We usually start out pretty good working on projects, but sometimes somewhere along the way, we forget we promised that for better or worse thing we actually said to each other that day oh so long ago. Surely they didn’t mean in these times too? 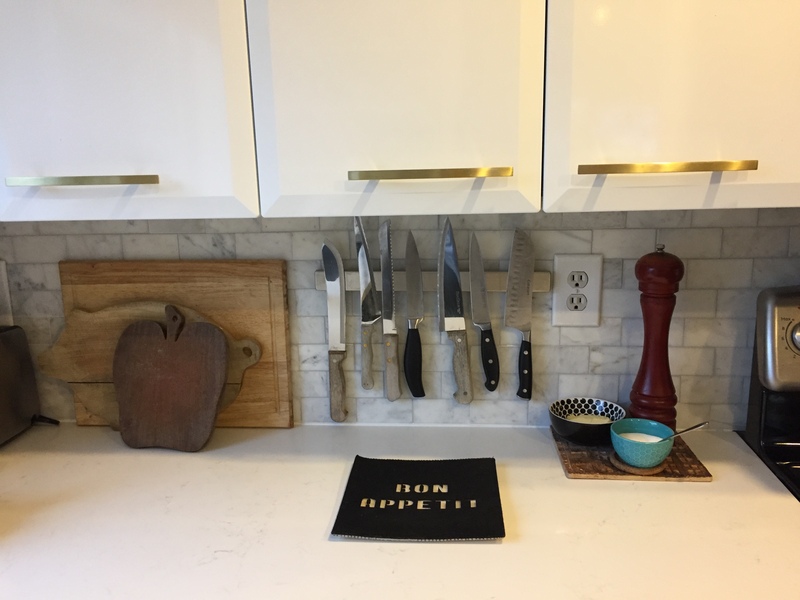 We considered white subway tile, either flat or with beveled edges, also a cool hexagon in marble or maybe white penny sheets. 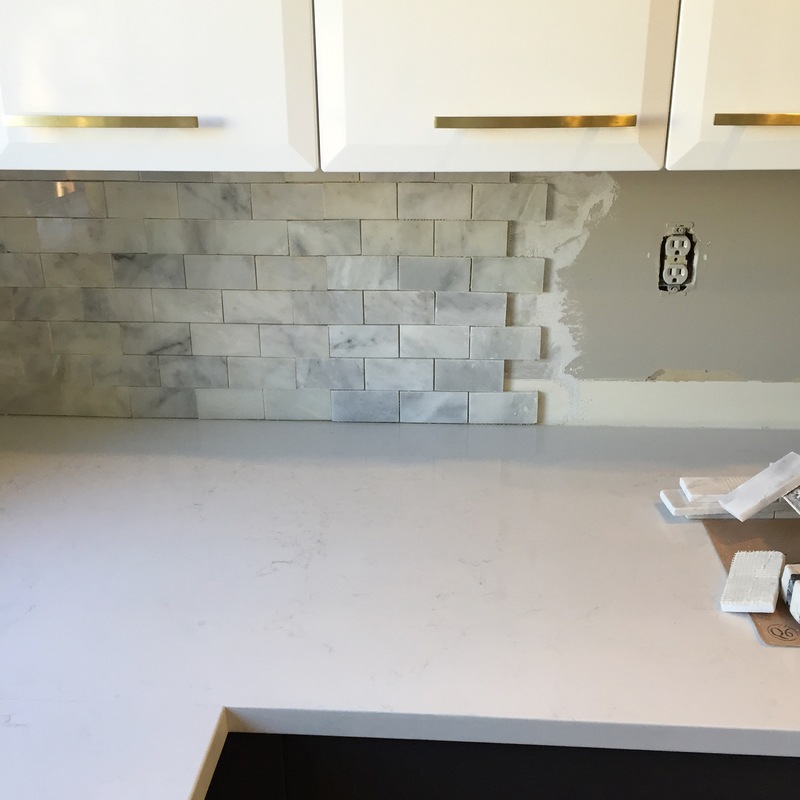 When we got the quartz countertops put in, it wasn’t measured correctly at the sink wall and the gap in some spots along that wall proved to be wider that others. This meant no thinner tile choices for me. Luckly, I had spotted this beauty at the local Home Depot. Pure marble subway with a nice thickness that covered that dreaded gap no problemo. The problemo that did come up however was finding enough tile. You know if you’ve been with me for any length of time that math is not my strongest skill (ok, honestly, there is not any skill in the math dept at all.) But I CAN do simple multiplication and so even though I figured out how much I needed, finding sheets I liked in one store proved more difficult than I expected. Some of the tile sheets were very yellow or crazy busy and as much as I wasn’t SO particular, I did want it to feel fairly calm and not chaotic. 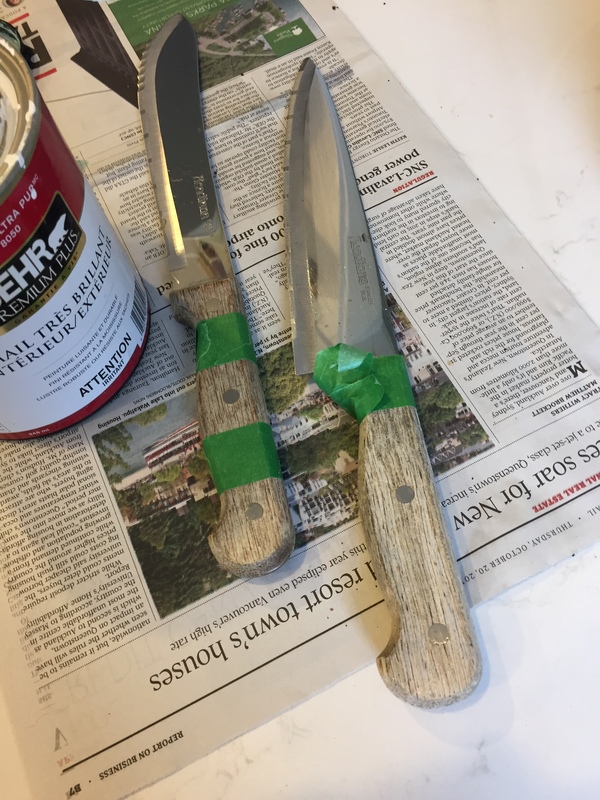 I did manage to get enough to complete the project and now figuring out the grout colour and considering the tools needed came next. 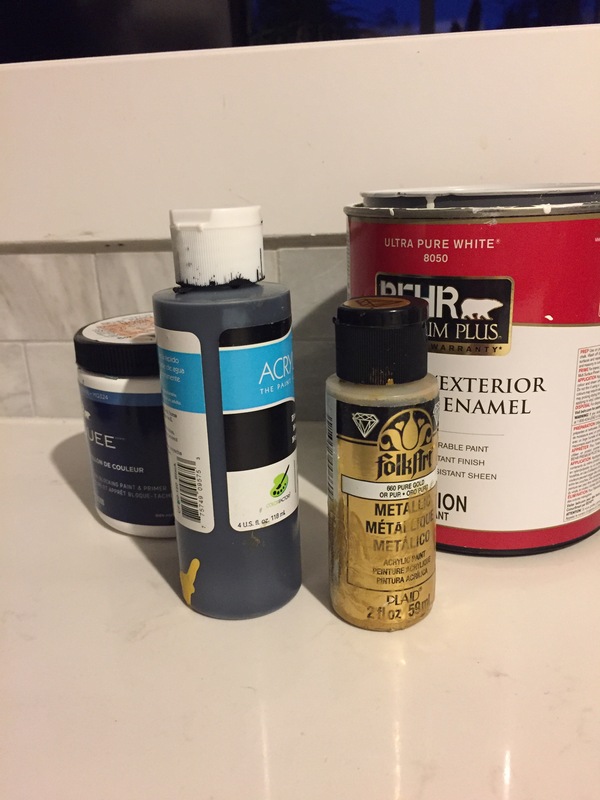 I opted with light grey grout, because I thought white would be both too bright and could possible get dirty looking quickly. We also debated on renting a tile cutter or buying one. We ended up buying an inexpensive one and I’m glad we did. Even though we knew we were going to be slow, we were even slower than that. It worked out to be much less expensive to own the machine than to rent it. It was not a fancy unit, but did the trick very well. Marble is a soft material and because of that it crumbled on some cuts or would refuse to cut straight. But for the most part, it was not too difficult to use. I would suggest to you to get good tile adhesive and I would tell you which brand I used if I could only remember! I could have sworn I took a picture of it, but I can’t seem to find it. 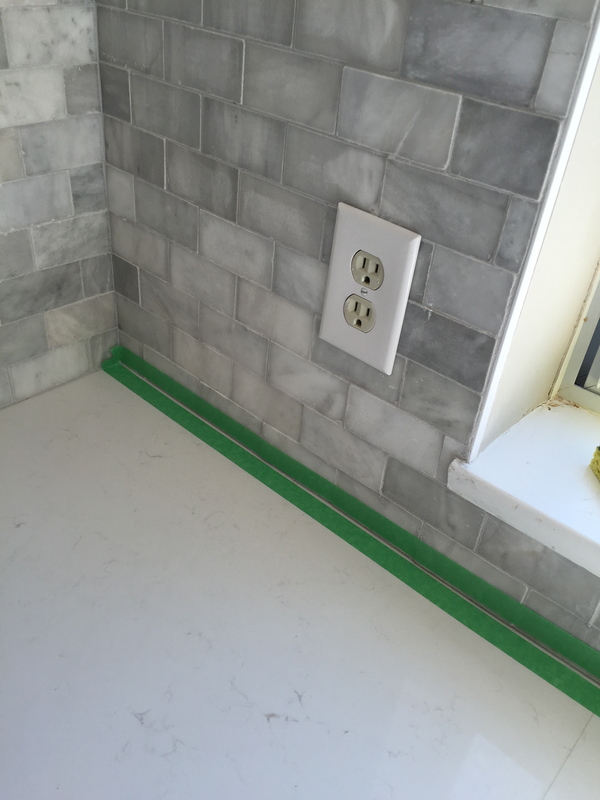 Along with the grout. If you really want to know, message me and I’ll get that info to you ASAP. I can say that the grout was a little more expensive than some but it’s the kind you never have to reseal. Ever. SOLD. Next came more math figuring out where to start so that everything lines up where it should. That took some figuring – which I didn’t do. Hubs did and thankfully he was good at it! 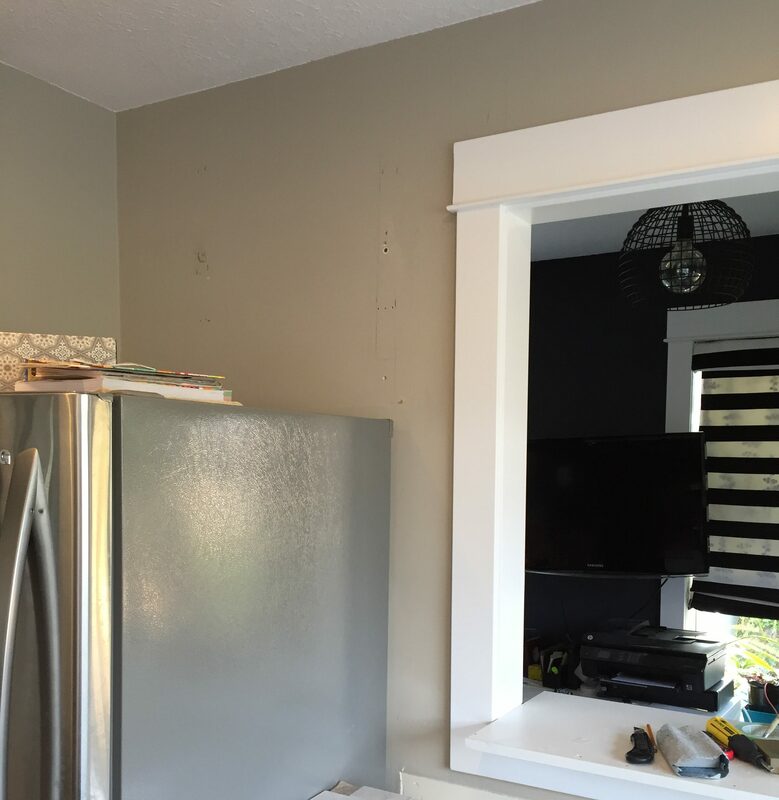 We moved along the wall, starting above and behind the fridge wall. We found we had to occasionally nail a nail here and there along the last bottom row of the tile as it did not have the counter to stop it from drooping and we certainly did not want to invest in tile going all the way to the floor when you wouldn’t ever see it. Later you will find out why we kinda did wish we had…. Man was this a messy job. Fighting never even came up (until we were almost done, if I’m honest) because it was all such a challenge getting it done as quickly and as straight as possible. What was most interesting to me was how busy the tile looks in pictures, where as it really isn’t so noticeable in real life. Sometimes we had to resort to using some tools for something they were probably not intended for but crossed over nicely. It was also quite amazing how Youtube came in handy more than once and even videos where the instructor wasn’t even speaking English could still translate. Da? Round the room we went, until we were done. 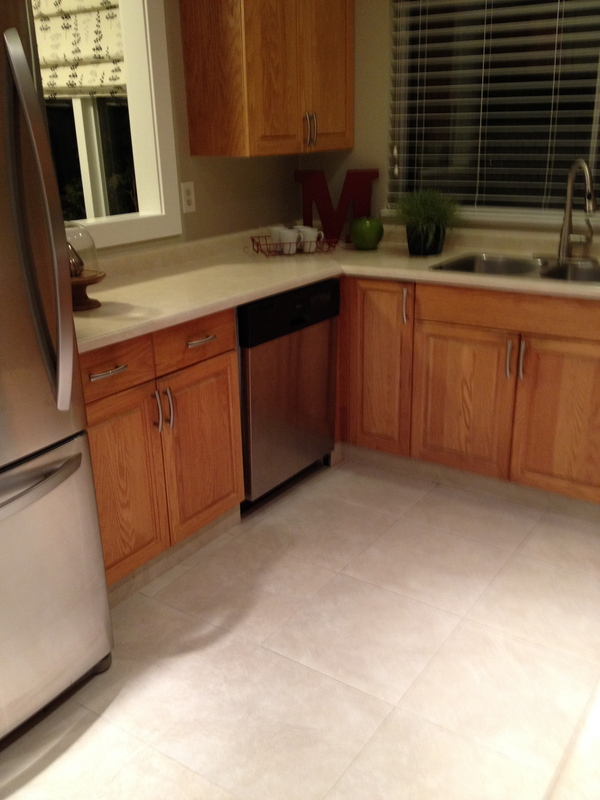 We grouted (so so so messy), washed off the tile and marveled that we actually did it ourselves! NEVER AGAIN I can tell you that, and I have a whole new respect (sing it!) 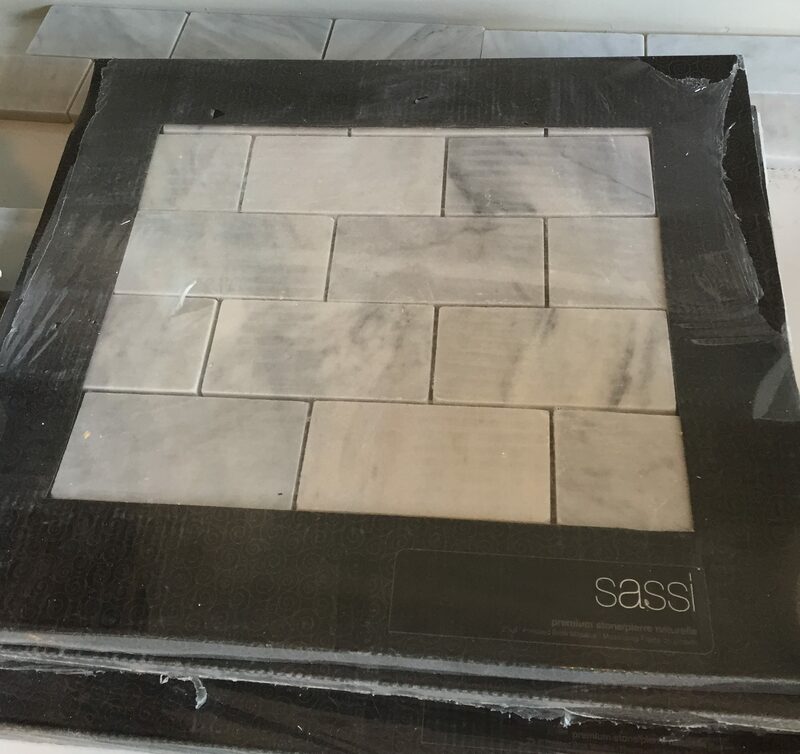 for tile installers. Mad props. See the gap along the top of this next picture? 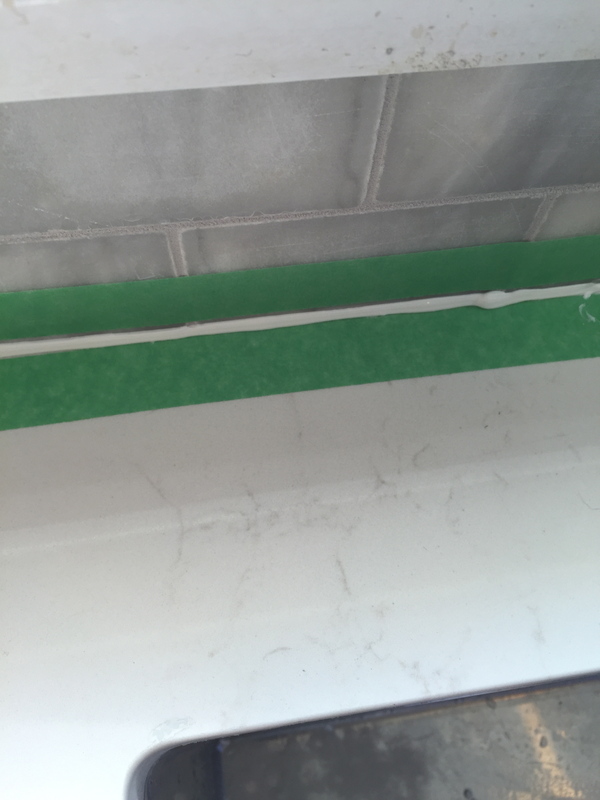 Because the ceiling was not straight or even, and again I came up against a gap, we decided after trying to cut the tile to thin slivers and winding up with bits of not straight tile we would be better off add quarter round and silicone to fill these areas. Some parts were an eighth of an inch to as much as half an inch. Not happy, but it turned out ok. I held it in place with painters tape and let it dry. Next came anywhere the tile hit the counter. Tape off the edge you want to fill above and below. Add the silicone along the edge. With a wet finger, run it along the gap until the silicone squishes and fills in the gap. Wait about 5 minutes only and peel off the tape. I learned the hard way that you don’t wait for it to dry too much, as it will pull the silicone off with the tape. Same principal as paint. Next came the shelves. 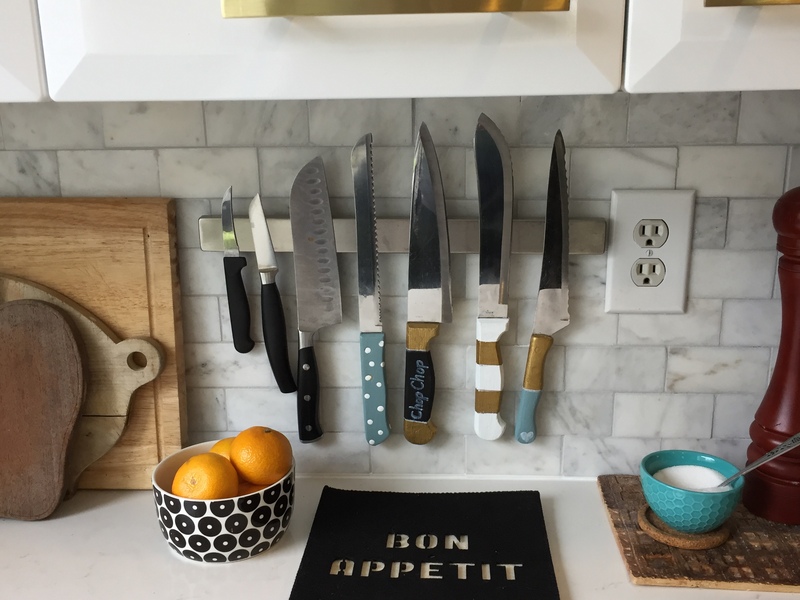 I had hoped to use Ikea’s shelves and brackets, but it turned out that to make our lives just a little easier that we should stick with where the studs already were than to drill through the tile, find the right plugs and hope once up they hold the weight of the dishes they were put up to support. I spray painted the brackets gold to match the cabinet hardware with my alltime favourite gold spray paint by Rustoleum. The Ikea shelves turned out to be too short and so we recycled some shelves our #1 son-in-law had given us from a tear-out. They don’t actually fill the entire bracket, but I don’t care that much. 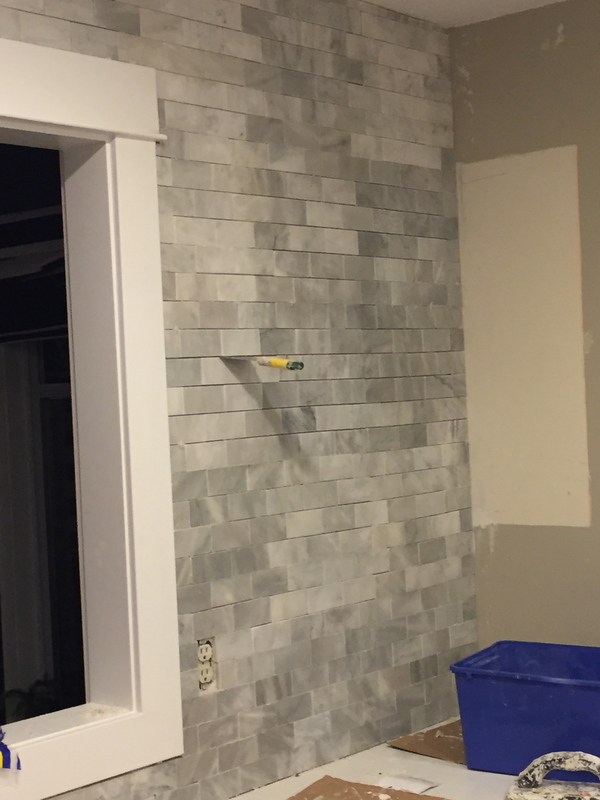 We got the proper drill bit for tile and after measuring where the shelves should go, held our collective breath and went for it. The shelves get continuously changed, depending on which dish we need for a meal or coffee. I will say however it looks great no matter what and I’m so glad I went with the open shelving instead of a cabinet. I feel like it helped the small room seem more airy and less cramped. The hits of colour don’t hurt, either. And as much as it pains me to show you this next picture, I need to come clean. 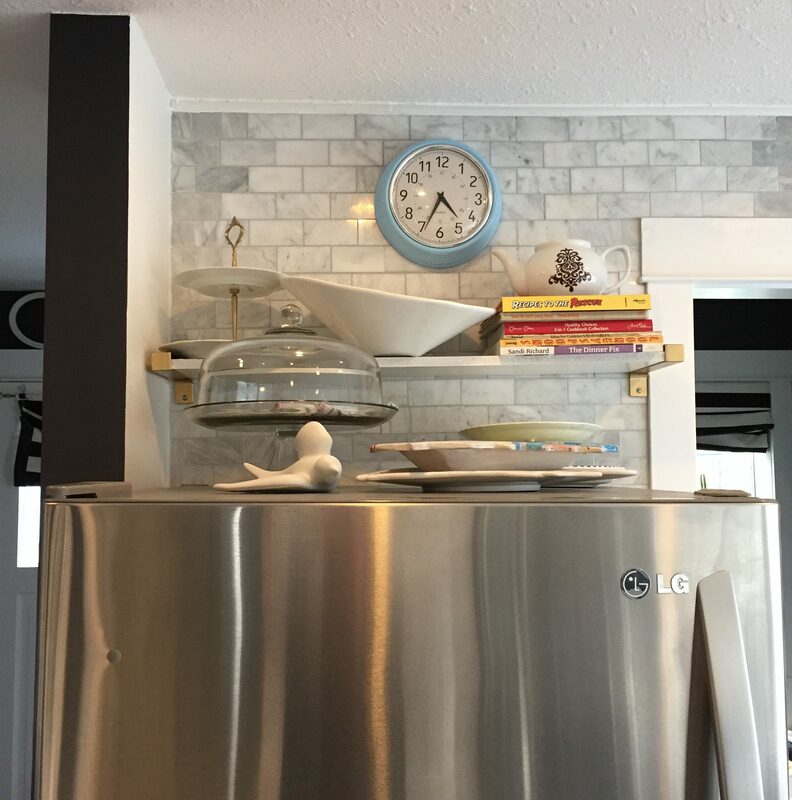 Even though I did my best to distract you with all the pretty things on the shelves above the fridge, the tiles had slid down on one end and they ended up not being perfectly straight. Actually I’m surprised any of it was perfectly straight, so I think it’s still a win. 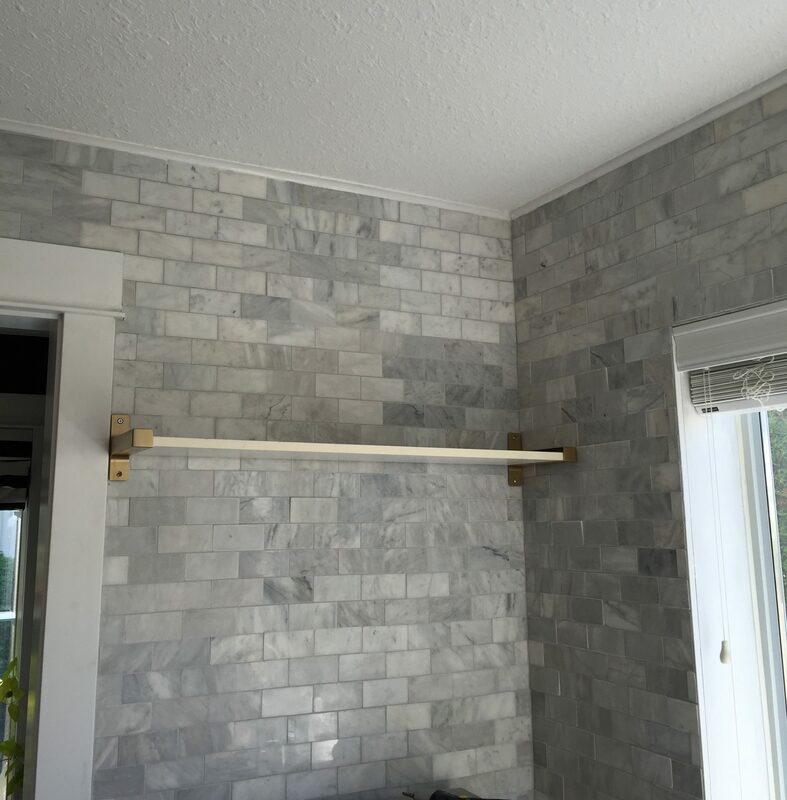 If you look closely, you will see we made the shelf slightly crooked so that the tile still looked straight. It’s kind of like when I put on makeup and blingy earrings. Distracting so you don’t notice the flaws so much. Right? Right? Don’t judge me too harshly, I managed to stay married through it all. 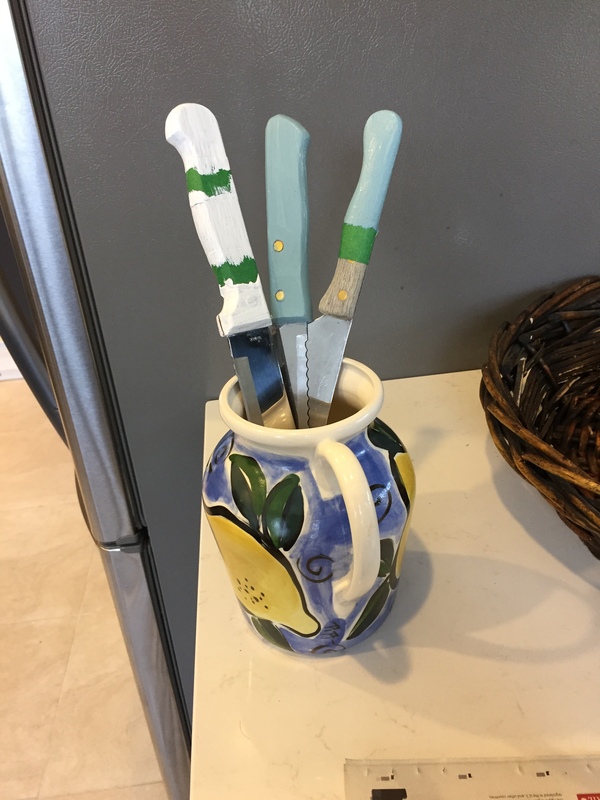 Here too is a little crafty bit: I took the old knife block which took up too much counter space and replaced it with the metal magnetic knife strip from Ikea. 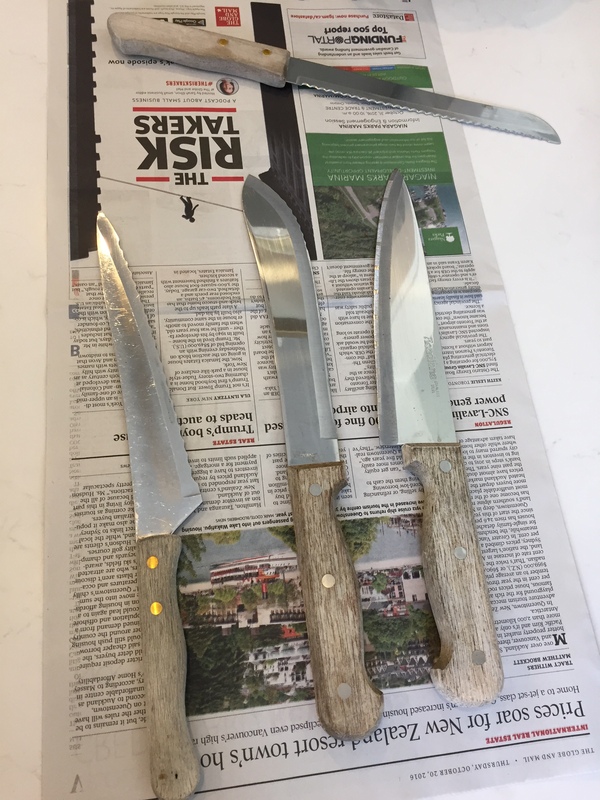 However, it now showcased how sad and worn the handles on my knives were. So I rounded up the usual suspects and had some fun. Next Post No DIY, but still Interesting?? Your kitchen looks wonderful. Well done. We have just (like two weeks ago) bought a new house. So, we’re in the process of selling one house and dreaming about all the things we can do with the other. You are totally my inspiration! 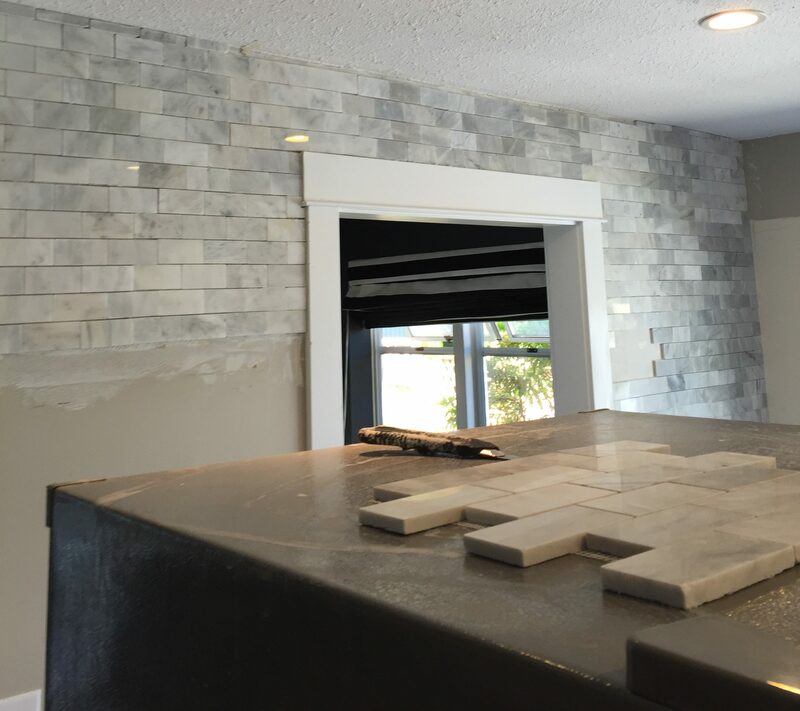 Absolutely stunning backsplash! I love, love, love your choices for this now gorgeous kitchen! Having the cabinets reach the ceiling creates a very high end look and the gold accents add to that even more! Well done my friend! My hubby and I are currently discussing an overhaul of our current kitchen as well and you have given me some major inspiration! Hope you had a great weekend! Wow, what a project. I wouldn’t have had the guts, but it turned out great! 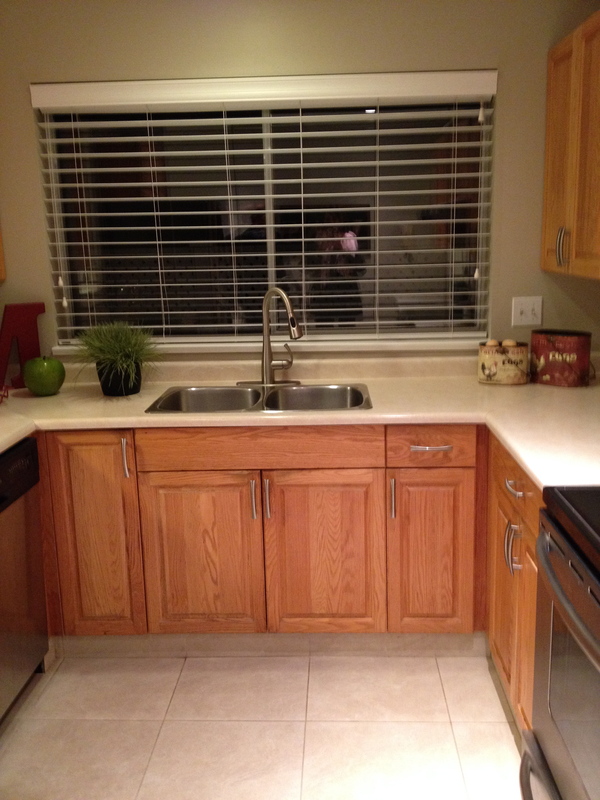 When we remodeled our kitchen we did wainscoting painted a bold red. Love, love, love…but it breaks my heart that much of it is covered by the fridge and a hanging cabinet we had to have because a) it’s gorgeous and b) it’s the world’s smallest kitchen and I needed the storage. How much do I love this??? How much, I ask you? I love the gold so much, and I know I’ve said I love the cabs. BEAUuuutiful!!! So, hubby and I are thinking we will tile his shower for our winter project. The question is, do I show him this, or not? 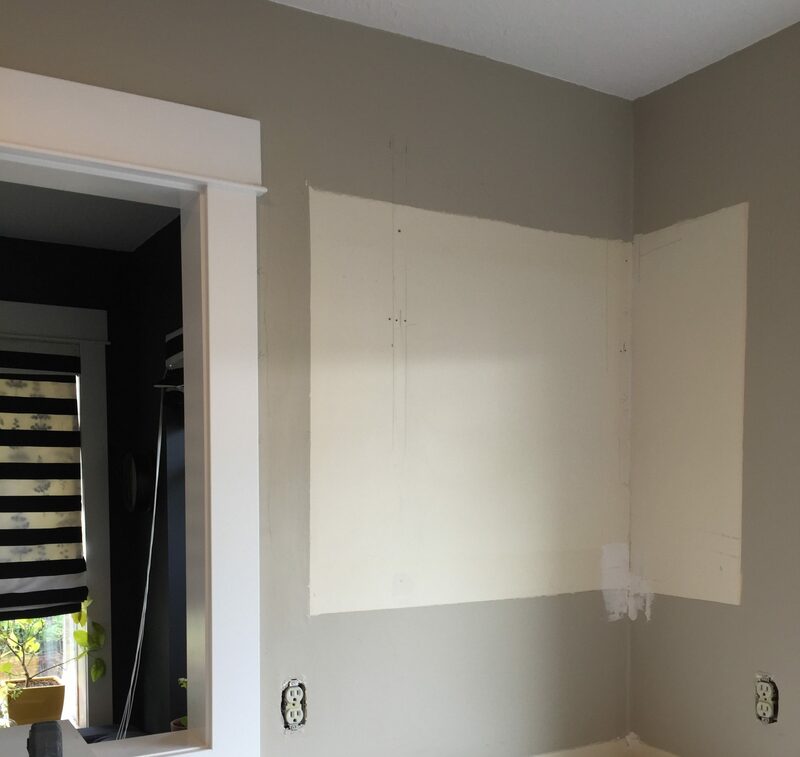 Your post is a nice example of complete DIY project and you did pretty well job but what I feel is that we have no match when it comes to being a professional painter and decorator. I’m sorry, but I respectfully disagree. I have seen many jobs done by people who claim to be professionals that were very substandard and left the customer with a badly done job and no recourse. I have had that happen myself. – including painting. But I appreciate your point of view and your comment.